The recent desecration of a World War II cemetery in Benghazi, Libya by what appears to be members of an Islamist militia underscores the difficulty in reconciling East and West in the aftermath of the Arab Spring. It also serves as a warning to other Arab countries what can happen when you remove the sitting government, be it good or bad. The video is pretty self explanatory. I have listened to it a few times - my Libyan dialect is not as good as my Syrian/Lebanese, but I'll share with you some interesting excerpts. Mostly they are just egging each other on, yelling things like "Break them, they're Crusaders* and dogs," "God is great," and "Let's start with that cross (the cenotaph)" interspersed with profanity. At about time code 1:00, one militiaman dislodges a headstone inscribed with the Magen David, the Shield of David (often called the Star of David), indicating the grave of a fallen soldier who was a Jew. The speaker remarks that this is "the grave of a Crusader." Everyone else appears to be focused on the large cross and knocking it down. Then the speaker realizes the grave is marked with the Shield of David and says, "Look at the flag on the front of it, this one was one of the Israeli battalion, it's Hebrew." Note that Israel was not yet a country when this soldier was killed. The militiamen then turn their attention to the large cross. The speaker tells the man on the ladder to break off the sides of the cross. Others shout break it, God is great, etc. with more profanity. At some point, they appear to give up on knocking down the cross, one remarking that "it isn't breaking." The video has made its way to other Arab countries. I received an email from a friend in Syria, a supporter of the regime of Bashar al-Asad. He is a physician who believes in secular government and although not a fan of the ruling Ba'th Party, believes it is better to maintain the current government than risk a takeover by the Islamist al-ikhwan al-muslimin (the Muslim Brotherhood). That is what we don't have in Syria; that is what they are trying to do to my country. But I think that we Syrians have more open minds than to let something like that happen here. What we are seeing in Damascus now are people from Afghanistan, Libya, Lebanon and Africa - it's not normal. We don't want what happened there (Benghazi) to happen in our country and I think the people will fight to keep our beautiful Damascus - Muslim, Christian and Syrian Jews. As as aside, there is a large British Commonwealth cemetery in Damascus with graves of 1077 soldiers from both world wars. The Commonwealth Countries hold a somber ceremony at the cemetery on Remembrance Day (November 11). I have attended these as a representative of the U.S. Air Force - quite moving. The Libyan government (or what passes for it) has pledged to find and punish those responsible for this outrage, and to restore the cemetery to its original condition. I hope they mean it, since it was the airmen of the United Kingdom and at least one of the Commonwealth countries - Canada - and their NATO allies that liberated them from the regime of Mu'amar al-Qadhafi. Otherwise, they will appear to be a nation of ingrates. * The actual word is صليبي - salibi, or "of the cross." It is commonly used as a derogatory term for Western troops, which they regard as Christian. Try an American soldier in an Afghan court - seriously? I was contacted yesterday (March 16) by Canadian radio station Newstalk 1010 in Toronto - I have done interviews for them in the past. They wanted to talk to me about the case of Staff Sergeant Robert Bales, the U.S. Army soldier assigned to the 3rd Stryker Brigade Combat Team (2nd Infantry Division) in Afghanistan accused of the murder of 16 Afghan civilians. When the booking producer called, he asked if I was available to talk about the Sergeant Bales case. I initially replied that I had no special knowledge of the case and that it appeared to be pretty straightforward. The sergeant did it, he confessed, was on his way to Fort Leavenworth where he will be tried by court-martial. That's how we do things in the American military. The producer said the two show hosts were interested in my thoughts on why the U.S. does not agree to transferring the soldier to Afghan custody for trial in the Afghan justice system under Islamic law. Since the crimes were committed in Afghanistan against Afghan nationals, why doesn't the accused face trial there? After my scoff at the concept of "Afghan justice," I explained the concept of Status of Forces agreements, usually called SOFAs, that define how these matters are handled in each country where the United States has forces deployed. I asked him if the Canadian forces would allow one of their soldiers to be tried in an Afghan court. He conceded that I had a point and scheduled the interview. I think the interview went well, although I did not listen to the discussion prior to my segment. I understand that the Canadians are more liberal, some would say even naive, about these things. While it sounds all "kumbaya" to want soldiers accused of crimes to be tried by the host nation, turning over an American (or Canadian or other NATO nation) soldier to a country that has no functioning government is not sound policy. How many young men and women would serve in the armed forces if they were subject to what would become arbitrary arrest, trial and punishment by any third world country in which they happen to be fighting? In this case, the hosts are being a bit hypocritical. In December 2008, a Canadian officer was accused of murdering an Afghan detainee. He was tried by court-martial in Canada. If the Canadians don't turn their soldiers over to the Afghans, why would they expect us to do otherwise? U.S. military personnel are to be accorded "a status equivalent to that accorded to the administrative and technical staff" of the U.S. Embassy under the Vienna Convention on Diplomatic Relations of 1961. Thus, U.S. military and DOD civilian personnel are immune from criminal prosecution by Afghan authorities. Further, they are immune from civil and administrative jurisdiction except with respect to acts performed outside the course of their duties. The Government of Afghanistan explicitly authorized the U.S. government to exercise criminal jurisdiction over U.S. personnel, and the Government of Afghanistan is not permitted to surrender U.S. personnel to the custody of another State, international tribunal, or any other entity without consent of the U.S. government. The immunity clauses are fairly standard, although they vary by country. In other countries, such as Europe and Japan where we have longstanding troop presence, the SOFAs also address tax liability, drivers licenses, ownership of property, importation of personal goods, employment of family members, etc. There are cases in which American military personnel have been tried for criminal violations of local laws. This is especially true in Japan where members of the Marine Corps and Air Force have been tried and imprisoned in Japan. There are also American servicemembers serving sentences in South Korean and German jails. The hosts also asked about the soldier's defense. Sergeant Bales is being represented by a high-profile and high-priced attorney - I am not sure who is footing the bill. It is pretty apparent that there will be a mitigating circumstances defense - Sergeant Bales has been wounded twice, having lost part of his foot in Iraq and suffering a head injury. He also witnessed a comrade having his leg blown off the day before the incident. Go to the Podcasts section and either download the podcast or listen on the site. The countdown time code for my segment is from 28:10 to 23:50. 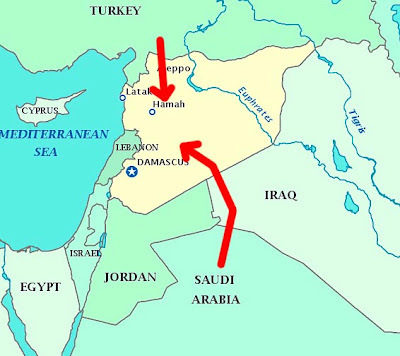 There has been a lot of talk about possible military intervention in Syria. Several U.S. Senators and Representatives have called for the imposition of a no-fly zone and offensive operations to protect civilians from the Syrian armed forces, similar to military operations in Libya a year ago. Over 8,000 civilians and defected soldiers are believed to have been killed by Syrian troops and the government-sponsored militia known as the shabihah. For the purposes of this article, I will not debate the merits of whether or not the United States, NATO or some other combination of countries and their armed forces should intervene. As most of my readers are aware, I lived in Syria for several years while assigned to the American embassy in Damascus. I am troubled by the footage I see in the media. Let's assume that the decision has been made to declare a no-fly zone and protect Syrian civilians from the military and security forces of Bashar al-Asad's regime. Let's also assume that the United States will take a leading role and not try to pass this off to its allies in the puzzling "lead from behind" strategy of the Libyan operation. First, let's disabuse ourselves of the notion that this can be accomplished with naval aviation. Even if we amassed several U.S. Navy carriers and some from our allies, there will not be enough offensive air power to accomplish the mission. Syria has a much more sophisticated air force and air defense system than that of Libya. Taking it down will require more force than can be launched from the decks of aircraft carriers. Carrier-based aircraft will be part of the mix, or course, as well as air and sea launched missiles, but not the major players. For this mission to be successful, it requires land-based aviation. Not to be dismissive of carrier-based aviation, but the numbers of sorties required and the lack of stealth assets in the Navy call for more capability than a few carrier decks can support. In contrast to carriers which can operate anywhere there are international waters, land-based aviation requires access to foreign air bases. That requires diplomacy to acquire basing rights in countries close to Syria. The most obvious venue from which to launch air operations into Syria is Turkey. Turkey is a member of NATO and is home to a U.S. Air Force wing at Incirlik Air Base. There are no aircraft permanently assigned, but the infrastructure is all in place to handle deployed aircraft. 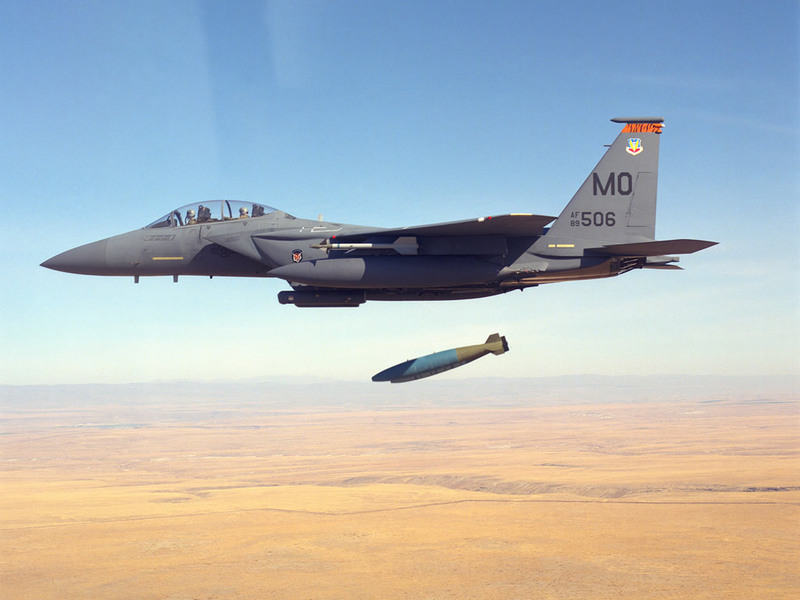 The U.S. Air Force and NATO exercise this capability frequently. Incirlik is located less than 100 miles from the Syrian border, just over 100 miles to the scene of Syrian army assaults on civilians in Idlib, and about 175 miles from Homs, scene of repeated regime assaults on civilians. There are other air bases in Turkey from which aircraft could operate over Syria. Should more air bases be required to augment Turkish air bases and whatever carriers are dedicated to the operation (virtually none were used in the Libyan operation), Saudi Arabia is an option. Saudi bases are approximately 600 miles from Syria, and about 750 miles to the southern cities which have been home to opposition activities against the government. Note that the flight route from Saudi Arabia to Syria overflies Iraq. Iraq has virtually no air defenses, so theoretically, U.S. and NATO aircraft could operate there with impunity, using Saudi airspace for air refueling. There is a possibility that Iran will attempt to defend Iraqi airspace if requested to do so by Baghdad. In addition to wanting to expand its relations with Iraq into the military arena, Iran also has a mutual defense treaty with Syria. Will Iran feel compelled to respond to a U.S.-NATO attack on its allies in Damascus? Will it do that by defending Iraqi airspace? Another option is to secure permission from American-ally Jordan to transit Jordanian airspace from Saudi Arabia to targets in Syria. I am of the opinion that the use of Jordan's air bases is not a viable option. Use of Jordan's airspace makes the journey from Tabuk air base in northern Saudi Arabia to Syria's southern cities less than 300 miles. The use of Jordanian airspace is more of a question than the use of Saudi airfields. Saudi Arabia is exasperated with the situation in Syria. It, along with all of the other members of the Gulf Cooperation Council (GCC), have closed their embassies in Damascus. Saudi Arabia and its GCC allies are wary not only of Iran's nuclear weapons program, but also its alliance with Syria. A likely outcome of intervention in Syria is the removal of the al-Asad regime and the Ba'th Party, thus a break in the Syria-Iran alliance, a move that would not be unwelcome in Riyadh. Once the decision is made to impose a no-fly zone and mount operations to protect Syrian civilians, as in Libya, we will need to begin with the destruction or suppression of Syrian air defenses. There has been a lot of press reporting about a "formidable" air defense system. I would assess the system as large, but not necessarily formidable. In the past, American forces have faced these supposed formidable air defenses replete with Russian radars and surface-to-air missiles. While the quality of much of Syria's equipment is questionable, they have a lot of it, and as we say often when dealing with huge numbers of usually reliable Russian weapons, "quantity has a quality all its own." Syria's air defenses are not unlike those we faced in Iraq. There is a national air defense system that is centralized and integrated not only with a variety of surface-to-air missiles, but with air force fighter aircraft as well. In addition, there are thousands of mobile air defense missiles and antiaircraft artillery pieces attached to Syrian Army units throughout the country. On my road trips as a military attache in Syria, I was constantly impressed with the number of air defense weapons all across Syria. That said, Israeli aircraft have had great success in neutralizing Syria's air defenses through a combination of excellent airmanship and state-of-the-art electronic warfare. There is no reason to believe that U.S. - and to some extent NATO - aircraft will not be able to operate effectively against Syrian air defenses. There is history for that assessment. As recently as 2007, Israeli jets bombed the al-Kibar nuclear reactor in northeastern Syria, conducting the raid virtually undetected until the bombs impacted on the targets. Israeli jets have on several occasions conducted low level overflights of Bashar al-Asad's summer palace in Latakia in northern Syria, again undetected until the jet roar was heard in the hallways. Once Syria's air defenses have been degraded to an acceptable level and the air force has either been marginalized, destroyed or deterred, then the pilots can go about the business of protecting Syrian civilians from the Syrian army and shabihah militia. With luck, as in Libya, it will lead to the fall of the as-Asad regime. It would be a good outcome - civilians will be protected, the autocratic Ba'th Party regime of Bashar al-Asad will be gone and hopefully the alliance with Iran will be over. One can only hope that without its tether to Iran, Lebanese Hizballah will collapse as well. If - and that's a big "if" - it is determined that the introduction of ground forces are required to properly coordinate the airstrikes or work with the Syrian opposition (primarily the Free Syrian Army), these should be small, special operations teams only. We do not need to put more American troops on the ground in the Middle East unless there are real American interests at stake, and we are prepared to actually fight to win a war and not devolve into a nation-building effort. The bottom line: Syria is not Libya, but American and NATO forces have the capability to impose a no-fly zone and protect Syrian civilians. The unknown is how much it will cost in terms of blood and treasure. After all, there will be casualties on both sides and there will be civilian deaths - it is inevitable in this environment. Does this Administration have the political will to do this? We cannot "lead from behind" on this one. The recent American Israel Public Affairs Committee (AIPAC) convention was an opportunity to hear senior elected Israeli and American officials speak on behalf of their countries. Representing Israel were President Shimon Peres and Prime Minister Benjamin Netanyahu, and representing the United States was President Barack Obama. In Israel, the president is the head of state, but it is the prime minister who is the head of government and wields the real power. 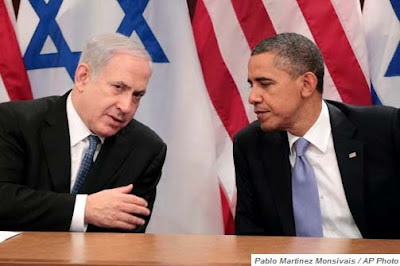 Thus, it was the remarks of Prime Minister Netanyahu that drew the most attention, as did those of President Obama. The main topic of both the Israeli prime minister and the American president was predictably Iran and its quest for nuclear weapons. Both spoke about their countries' assessment of the Iranian nuclear program and actions they believe are required to prevent the Islamic Republic from acquiring a nuclear weapons capability. The Israelis have no doubt that the Iranians are developing a nuclear weapon; the U.S. intelligence community has surprisingly not yet made that determination. 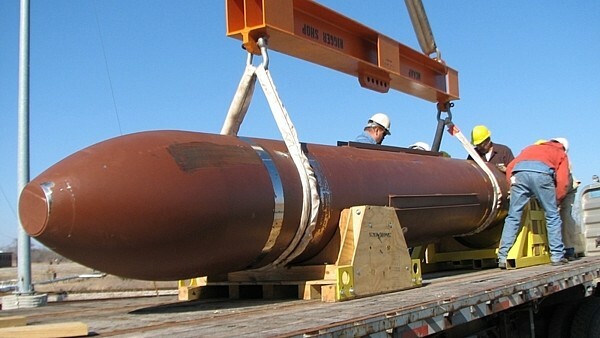 It is important to dissect the words "nuclear weapons capability." In the past, the American intelligence community sought to distinguish between having the capability to develop nuclear weapons and actually building them. The former was deemed to be acceptable, while the latter was not. If one can believe Secretary of State Hillary Clinton's words, the Administration no longer makes that differential. Mrs. Clinton said that the Obama Administration is committed to prevent Iran from not only developing a nuclear weapon but the capability to develop a nuclear weapon. I hope she means exactly that and we don't hear a State Department spokesperson later tell us "what the Secretary really meant" is something different. Although President Obama spoke on Monday, and Prime Minister Netanyahu on Tuesday, let me address the Prime Minister's remarks first. 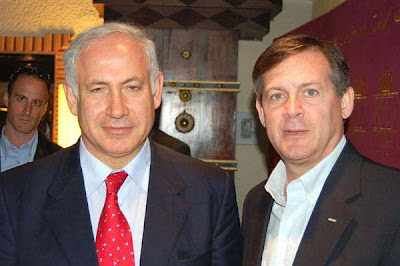 I was not particularly surprised by anything Netanyahu had to say - I have been hearing the same message from him since I discussed this with him prior to him becoming prime minister. His words as leader of the opposition carried the same message - a nuclear armed Iran constitutes an existential threat to the state of Israel and Israel will not put itself in the position of being faced with that threat. Israeli leaders often invoke the memory of the Holocaust and its resultant legacy - "never again." Netanyahu stated that Israel has waited patiently for the international community to address the Iranian nuclear program. 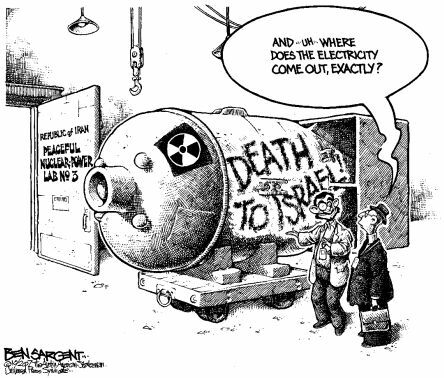 Many Israelis feel that the rest of the world sees Iran's nuclear ambitions as an Israeli problem and want Israel to solve it. Mr. Netanyahu believes Iran is an international issue and wants the international community to solve it. Israel has watched the United Nations and the United States try to change Iran's behavior through peaceful means, to no avail. Israel has waited for diplomacy to work, has waited for sanctions to work, but believe that the Jewish state is now running out of time. The Prime Minister was unequivocal in his resolve - Israel reserves the right to defend itself, and will exercise that right if it believes that is in its national interest and when they believe it is in their national interest. Given their history, it's understandable. These are the words of a leader. Now to President Obama's remarks. Someone listening to the President for the first time would conclude that he stands shoulder to shoulder with the Israelis, that he is willing, in the end, to use American military might to take action against Iran if all other options fail. The listener would also conclude that the United States has pursued a deliberate course of diplomacy, followed by increasing levels of sanctions and at all times has been willing to listen to the Iranians should they decide to accept the wisdom of the leader of the free world and reject a program they have been pursuing almost to the exclusion for all others at great expense for years. That is what the ever eloquent, polished orator - President Obama - wants you to believe. The man can read a teleprompter. The words were all there, carefully chosen, probably run by a focus group or two, with just enough American bravado to appeal to the average listener here and in Israel. When all is said and done, however, the only audience that matters is the senior Israeli leadership - they are who this song and dance was written for. Mr. Obama must convince Prime Minister Netanyahu and his inner circle that the President is sincere in his proclamation that the United States - in this case the President of the United States - "has his back." Given the parade of senior American political and military officials that have visited Israel in the recent past telling the Israelis that attacking Iran is a bad idea, the President's words are a bit puzzling. I realize he is asking the Israelis to give his endless and fruitless diplomatic efforts and the heretofore weak sanctions more time to succeed, but does he think they will buy it? The sanctions are hurting the Iranian people, yes, but there is no indication that the nuclear weapons program has been affected at all. In fact, the program seems to have gained steam as the levels of sanctions increase. It is hard to imagine the Iranian leadership abandoning their number one priority because its people are suffering under sanctions easily blamed on the West (primarily the United States). 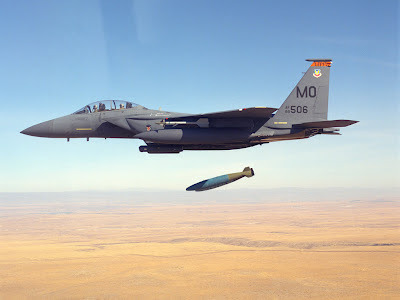 The Obama strategy - tell the Israelis (and Americans) what they want to hear and stall any Israeli unilateral strike on Iran until the elections are over. After the elections, revert to the usual Obama Administration shoddy treatment of Israel and maintain the Iranian crisis at a level that does not require anything other than calls for diplomacy and sanctions. At some point, the Iranian program will have progressed beyond the point of no return and an Israeli military operation will no longer be a viable option. Mr. Obama's eloquence is remarkable - he can work an audience. However, I fear his words are the words of a reader, but not a leader. I know it, the Israelis know it, and yes, the Iranians know it. 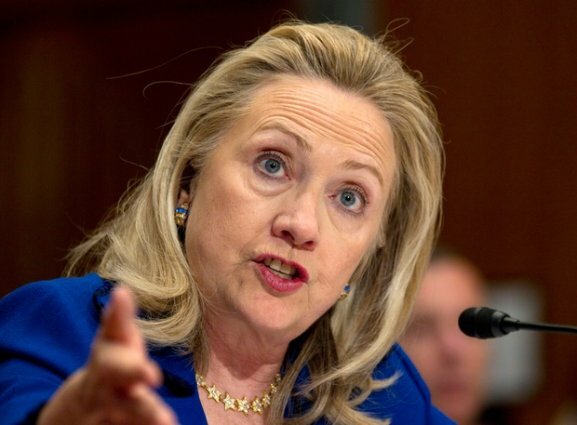 Secretary Clinton, where are the "crippling" sanctions on Iran? For three years now, Secretary of State Hillary Clinton has been promising "crippling" sanctions on the regime in Iran if it did not open its nuclear facilities to international inspection and halt its uranium enrichment program. I wish she would at least call the Iranian program what it is - an effort to develop a nuclear weapon. Thus far, the sanctions that have been imposed on Iran have not had any real effect on the nuclear program - Tehran has been enriching uranium for years, despite cyber attacks on the centrifuges and assassinations of key nuclear scientists. The new sanctions, mandated by Congress in the National Defense Authorization Act, will target any private foreign financial institutions that "knowingly conduct or facilitate any significant financial transaction" with Iran's central bank for any purpose other than the purchase of petroleum or petroleum products. That's not a typo - other than the purchase of petroleum or petroleum products. In other words, Iran is free to sell its oil and refined products without any penalty. The penalty is only imposed when a bank facilitates the purchase of other Iranian products. Like what - pistachios? Weapons? Iran doesn't sell weapons to its ally Syria or its terrorist group proxies - it just provides them. Iran makes its money from the export of oil. Iran is the world's fifth largest oil exporter and the second-biggest OPEC producer after Saudi Arabia. If you seriously want to sanction the Iranian regime, you need to limit their ability to sell that oil. Closing off access to the international banking system is an excellent way to do that. We know it will be effective - it was when this level of sanction was proposed that Iran retaliated by threatening to close the Strait of Hormuz. That threat validated the potential effectiveness of the proposed sanction. So why aren't we doing what we know will be effective? The Administration is trying to have to have it both ways. It wants to appear to be imposing the "crippling" sanctions it has been promising for over three years. In that three years, while the Administration has been taken in by repeated Iranian offers to re-open negotiations that never go anywhere, Iranian physicists and engineers have continued to refine uranium and develop other nuclear weapons components. Some good news, though, from the Secretary. Just this week, she clarified that the Obama Administration is committed to prevent Iran from not only developing a nuclear weapon but the capability to develop a nuclear weapon. 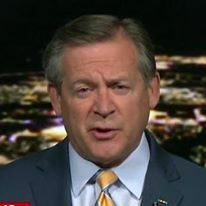 It is not merely a semantic difference, it is a clear statement that we will not allow the Iranians to do what previous national intelligence estimates have used as an excuse to not declare Iran's program a nuclear weapons develop program - to develop all the tools and capabilities to build a weapon, but not actually assemble a device. That was semantics from an over-cautious politicized intelligence community. Of course, Secretary Clinton has made other statements that seem to contradict her supposed tough stance on Iran. "What we are intending to do is to ratchet up these sanctions as hard and fast as we can, follow what's going on inside Iran, which seems to be a lot of economic pressures that we think does have an impact on decision-making." Poor syntax aside, if she really means what she says, why are we not imposing the "crippling" sanctions we know will work, the "crippling" sanctions she and the President have been promising for years?